Before we got married, we bought our dining room table and two chairs off of KSL (like Craigslist) for supppper cheap. We spent a few weekends sanding them down and painting them. 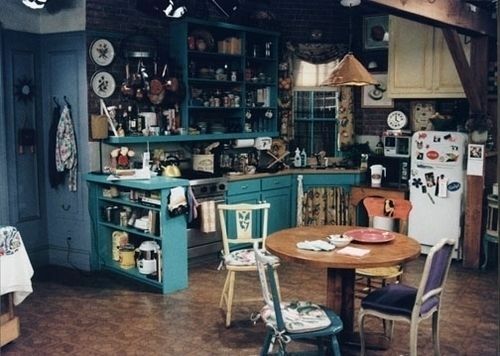 Inspired by Monica Geller’s table, we painted our table black and chairs blue. I found two more chairs at the DI and decided, while it was still sunny and warm outside, to fix them up. Here’s one of the lovely chairs before. The fabric had a bunch of stains on it and the wood just didn’t match anything else in our house. Sadly, I don’t have a picture of the other chair beforehand. Some sanding and a few coats later, this is what they looked like. With a gift card in hand, I walked over to Joann’s (I love having 2 fabric stores within walking distance!) and chose two different fabrics. Then I just stapled them to the cushions. The people who owned these chairs before had recovered them, so I ripped off a few layers of fabric until I got down to the original layer. Then I just covered that fabric with my own. I’m pretty sure a staple gun would have worked wonders, but I only had a regular stapler. It worked out ok, but I would definitely recommend a staple gun! Here are the after pictures. I love how they turned out! Along with the flowers from the hubs, the chairs definitely brighten up our dining room. Just Saw your instagram shots of these and absolutely loooooove them!! Adorable! Love these! They look fantastic! well aren't you just a little miss crafty. ;D you are too talented! the designs are simply ca-ute. Birthday present for Bri- staple gun. Gaaaaa! You never cease to amaze me with your crafty talent!! Love these two chairs. They are so cheerful, happy, and look darlingly perfect in your home. xoxoxoxo love you! Joann's has the cutest fabric! Love the chairs! seriously child quit being so flippin cute and crafty and just cuuuute! ahh. you kill me. those are so cute! love them. Oh my gosh, this looks amazing! I definitely don' tthink I would have picked out that blue color, but it looks awesome on your chairs and with the pops of yellow. You have some serious talent, girl! So cute! Can you come decorate my house please?